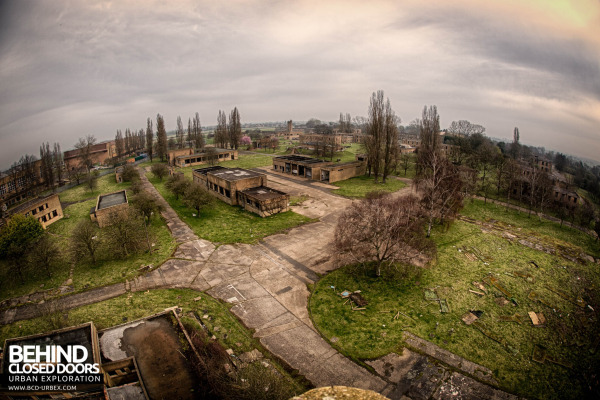 A view of the derelict RAF Upwood base from the water tower. (From Behind Closed Doors website). I came across a few interesting sites that document the abandoned RAF Upwood base near Ramsey, Huntingdonshire. German spy, Josef Jakobs, landed near Ramsey on January 31, 1941 and MI5 speculated at the time that he might have been sent to snoop around the airbase. While Josef had a Shell Touring Map of England in his possession, he most definitely did not have a map of RAF Upwood. A couple of penciled marks on the map seemed to coincide with RAF Upwood and RAF Warboys, but are not perfect matches to either location. As mentioned in the previous blog post, the circle on Josef's map likely marks the place where the German aircrew of his plane hoped to cross into the general drop zone. The "x" on the map marks the likely location of where the aircrew hoped to drop Josef. "In February 1941 a German spy named Josef Jakobs was discovered by a farmer, after he parachuted into the area resulting in a broken leg. He was found to have maps of RAF Upwood, a code device and £500 in his possession. He was interrogated by MI5 and spent several months at Dulwich hospital before being put on trial. He was found guilty of treachery and was executed by firing squad at the Tower of London"
"However, one of the most notable wartime stories concerning RAF Upwood was that of German spy Josef Jakobs, who was captured by local farmers after parachuting into the area and breaking his leg. Found in possession of a code device, £500 in cash and maps of the RAF base, Jakobs was interrogated by the security services and executed for treachery at the Tower of London in August 1941. Both sites are mostly accurate, except Josef did not have maps of RAF Upwood. "Interesting tid bit of history: When captured, German spy Joseph Jakobs was found to have RAF Upwood maps in his possessions amongst other things. He was court-martialled and sentenced to death by Firing Squad in 1941."